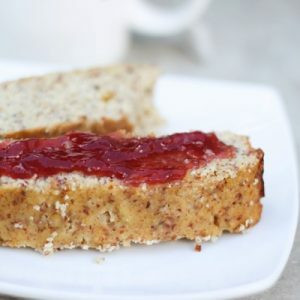 A dense and sweet Paleo bread with bright lemon flavor. Perfect for an afternoon snack or breakfast accompaniment. 1. Preheat the oven to 350, and grease a standard loaf pan with nonstick spray or coconut oil. 2. In a large bowl, whisk the eggs, and then stir in the remaining ingredients. Mix well. 3. Spread the batter into the loaf pan evenly, and bake for about 35 minutes until golden and set. 4. Allow to cool completely in the pan before storing, covered, in the fridge.